HTML5 introduced several new input types for <INPUT> element. These new input types include number, range, email, url, color, date, datetime and a few more. Though these types are not fully supported by all desktop browsers any ASP.NET developer should know them because newer browser versions will definitely support them. In this article you will learn the basics of using the new input types. More importantly you will also learn to use them with ASP.NET Web Forms and ASP.NET MVC applications. HTML5 provides the following additional values for the type attribute of <INPUT> tag. They help you to restrict user entry to a fixed set of values avoiding data entry errors. For example, when you use input type as range the user can only enter or select from a fixed range of values. Browsers render the <INPUT> tag in a different way depending on the input type. 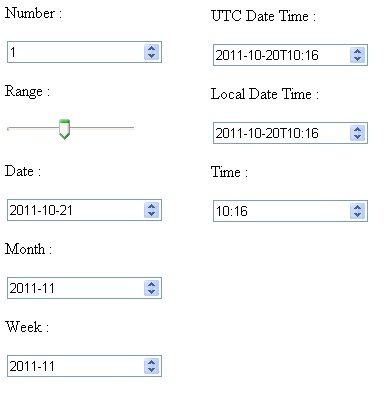 This simplifies data entry for the end user. It should be noted, however, that not all browsers (desktop versions) support these new input types. Also, there are certain differences (though minor) in the way the input elements are rendered and the way error messages are displayed. For example, consider the following screen shot that shows a same HTML5 page in Chrome 14 and FireFox 7. Chrome and Opera provide reasonably good support for many of these input types though at some places they may render a primitive user interface. In the remainder of this article I will be primarily using Chrome to illustrate how the new input types work. In order to see how these new input types work, create a new HTML page and add the following markup to it. Notice the type attribute added to <asp:TextBox> tag. This way you can specify any new HTML5 input type and the resultant control will be rendered accordingly. The way you access TextBox server control on the server remains unchanged. HTML5 introduced several new input types for <INPUT> element such as number, range, email, url, color, date, datetime and a few more. These new input types are great because they allow you to validate user input without using any client side script. Currently not all the browsers support these input types but next versions of all the leading browsers are bound to support them. You can start using these new input types in ASP.NET web forms and MVC applications with little or no extra work.